The warehouse of the Italian company Centro 3A SPA, equipped with Mecalux selective pallet racks, has capacity for 7,826 pallets. This system facilitates direct access to the goods, which streamlines the storage and picking tasks. Pallet sizes: 32" x 48"
Centro 3A SPA (pertaining to the Auchan group) is the supplier company of the Simply supermarket chain in Italy, which includes brands such as Simply Market, Simply Point and La Bottega Simply. It offers a broad assortment of food products at the best possible price, in supermarkets where special attention is paid to friendly, quality service. Due to the growth experienced by Centro 3A SPA in recent years, its Asti warehouse (in Northern Italy) has been expanded several times to meet the enterprise's needs. 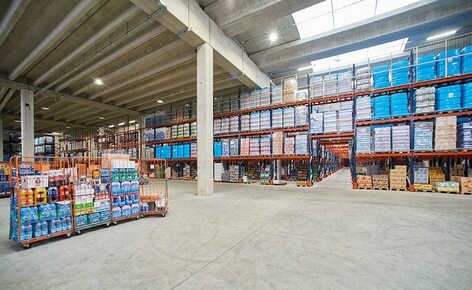 Mecalux has supplied 26' high selective pallet racking that amounts to a storage capacity of 7,826 pallets. A pallet rack system is suitable when storing a large quantity of pallets with many different SKUs. One of its main advantages is its adaptability to any type of load, weight and volume variable. Direct access to all the products provides high flexibility when managing goods and preparing orders. In addition, it guarantees perfect stock control, since each location is assigned to a single SKU. On lower levels, picking is carried out directly from the pallets and reserve products are deposited on upper levels, making the required merchandise available at all times. An underpass cuts crosswise through the racking and facilitates the flow of movements, in addition to acting as the emergency exit. The remaining levels on top of the passageway have electro-welded mesh to prevent the accidental fall of materials. Top capacity: the Centro 3A SPA warehouse has a storage capacity of 7,826 pallets, suitable for supplying its supermarket chain. Elevated productivity: direct access to the merchandise guarantees a more flexible goods management and a massive flow of incoming and outgoing products. Adept picking: selective pallet racks facilitate orders being directly prepared from the pallets housed in the lower level.